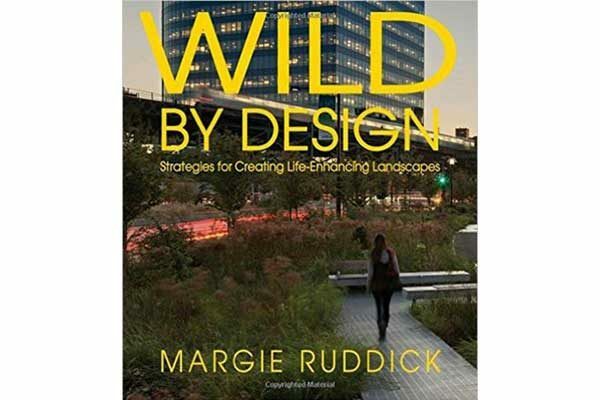 Wild By Design: Strategies for Creating Life-Enhancing Landscapes recounts the work of Margie Ruddick’s self-named firm over the last 20 years, by sorting a wide range of projects through various lenses of sustainable landscape design. Projects span continents and biomes, from a phased, 10-year masterplan for a 2,500 acre eco-resort in Maharashtra, India, to her own front yard in Pennsylvania. The book is accessible to those who know little to nothing about landscape architecture and what landscape architects actually do, though the conclusions and generalizations about defining sustainability, ecology, and art in practice are not new to those in the profession. Ruddick clearly comes across as a pioneer in the field of ecological landscape design, and one can trace various movements of formalism to landscape urbanism through the various projects her firm develops over the years. The outstanding narrative in the compilation is undoubtedly her telling of loose strategies for experimentally maintaining and managing a succession of self-seeding plants on her front yard, eventually leading to a summons from the City of Philadelphia for allowing weeds to grow more than 10 inches tall. Beyond being a home grown starter of the wild planting movement, the story illuminates so much about the potency of gardens and landscapes to affect and connect people and natural process. First, there is the recognition that the landscapes that surround our home shape our sense of place and understanding of their nature. Their ‘wilderness’ stays with us for a lifetime. Second, there are the designs, the intentions, and human hands that shape over many years of selective removal, addition, and mowing, formal patterns to bring order into the landscapes that foreground our everyday lives, but belong to a larger picture. Third, they are sites of social and cultural exchange – neighbours, cultural norms (a mowed lawn), and city bylaws that shape the form and function of patches of earth we deem partly shared, and partly ours. Ruddick’s favourite mantra “what are we doing here, anyways?” – the original working title for the book – serves as a gentle reminder to continually challenge our learned ways of thinking and doing in design practice. If you want more information on Wild By Design, visit the Island Press website. Shelley Long is a landscape designer interested in cross-disciplinary collaboration in environmental design, Canadiana, and place-making through space-making.